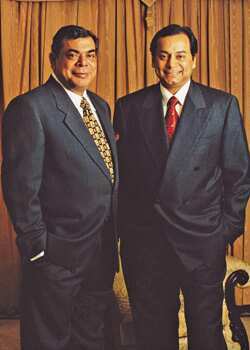 Facing questions: Essar Group chairman Shashi Ruia (left) and vice-chairman Ravi Ruia. New Delhi: A fter a year-long investigation, the department of telecommunications or DoT proposes to send a show-cause notice to Loop Telecom Pvt. Ltd asking it to explain why its unified access service, or UAS, licences to offer mobile phone services in 21 operating areas should not be terminated. Clause 8 of the UAS licence agreement signed by the telecom operator and DoT says that no licensee should hold more than 10% equity in another licence-holder operating in the same service area. At the heart of the issue is the Essar Group, which, through firms registered in India and Mauritius, owns 33% of Vodafone Essar Ltd, India’s third largest mobile phone company, besides the significant control it wields indirectly over Loop Telecom. Vodafone Essar has a UAS licence. Once Loop Telecom receives the DoT notice, it will have 21 days to respond. If the reply does not come by then, or is deemed to be unsatisfactory, it could lead to Loop Telecom losing its licence, said a senior DoT official, who didn’t want to be named because he isn’t authorized to speak to the media. DoT referred the issue to MCA for investigation on 5 August 2008 following complaints from Janhit Morcha, a Haryana-based political party, former member of Parliament Ajay Chakraborty and New Delhi-based non-profit Telecom Watchdog. “ MCA has pointed out that while Essar Group holds only 9.9% equity in Loop Telecom both directly and indirectly, there is significant financial control exercised through the complex financial structure created by Essar Group which leads to Loop Telecom," the DoT note said. The MCA has found that the Essar Group has “significant financial control" over Santa Trading Pvt. Ltd (STPL), which, in turn, owns 76.7% of equity in Loop Telecom. “Thus Essar Group can be stated to have significant control over Loop Telecom," the note said. “STPL’s share capital is only ₹ 1 lakh. This creates a debt equity ratio of 1,59,200 for STPL. This is astronomical compared to that of even a strongly debt-leveraged company concern," the note adds. In January, Mint reported that MCA had launched an investigation into the shareholding of Loop Telecom. The report said that the Essar Group may actually be controlling Loop Telecom without owning it. This has been made possible by a multi-tiered structure that separates ownership and control, and by using instruments such as non-convertible debentures, or NCDs (essentially, debt that cannot be converted into shares), it said. “We are in full compliance with the licence agreement signed with the DoT as Essar Group owns less than 10% direct/indirect equity in the company," said a Loop Telecom spokesperson. “Therefore, the question of Essar Group having control over STPL and such control being illegal does not arise." The Essar Group declined to comment on the matter. Loop Telecom is owned by BPL Communications (24%), BPL Mobile Communications Ltd (51%), and Capital Global Ltd, Mauritius (around 24%). BPL Communications holds a 69% stake in BPL Mobile Communications, and around 80% of the former is held by STPL, owned by Kiran Khaitan, the sister of the Ruia brothers, Sashi and Ravi, who run Essar. That would mean that anyone who controls STPL also controls Loop. The remaining 20% of BPL Communications is owned by companies with names such as Black Lion and Inditel Holdings, and the Mauritius-based Deccan Asian and Aidtel Holdings. STPL is controlled by the Khaitan family and not just Kiran Khaitan, an Essar Group official told Mint in January, and added that according to the Companies Act, a married sister is not considered part of the same family. Essar Teleholdings Ltd (ETHL), which holds 9.9% of BPL Mobile Communications, which offers wireless services in Mumbai under the BPL Mobile brand, has subscribed to 90 million NCDs of STPL, valued at Rs1,592 crore. Such convoluted structures were common in the Indian telecom business in the late 1990s and early 2000s, when Indian promoters wanted capital but couldn’t divest more than 49%, which was then the ceiling on foreign direct investment in telecommunications. They got around this problem by setting up a holding company in which they would divest up to 49%; have the holding company float a subsidiary in which they would again divest up to 49%; and then have the subsidiary hold the telecom licence. Since then, however, India has raised the cap on foreign investment in telecom firms to 74%. Mint’s reporting for the January news story was based on the shareholding data provided by the Essar Group and the Registrar of Companies, an MCA arm, and showed that while Loop has significant connections to the Essar Group and ETHL, it doesn’t meet the technical definition of being controlled by either of these. According to Indian corporate law, control is defined by direct ownership of a majority stake—or at least 51%.